Blog Quick Quotes: Fall Inspiration with Dana! Hi Quick Quotes fans! 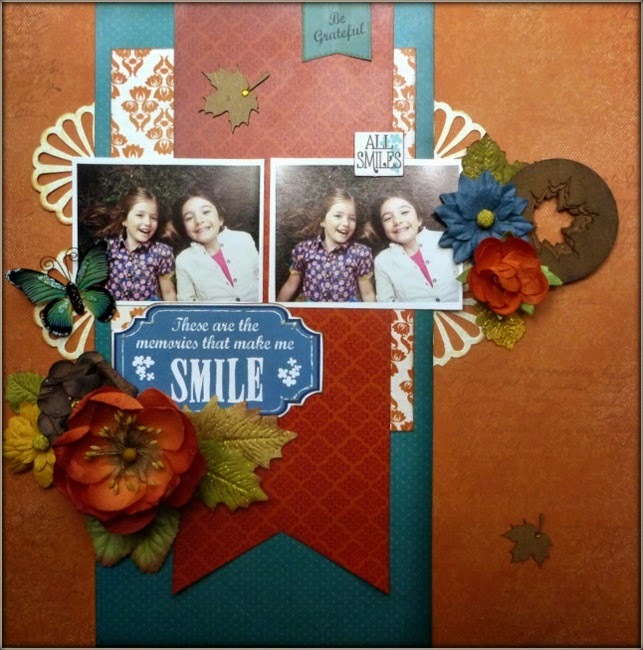 Dana here today sharing a fall inspired layout. In addition to the rich browns, oranges and reds of the traditional fall color palette, I've added in some teal and blue for a fun twist. I've mixed patterned papers from the Sheer Joy, Serendipity and Calypso collections on this page. I added some subtle script stamping using Creamy Cocoa PowderPuff Chalking Ink. I used Java PowderPuff Chalking Ink along the edges of all the patterned papers for a stronger contrast. I used this sentiment that I cut from the Serendipity Words and Phrases Strip for a long title. I dressed it up with some pearl accents. I used the Fall Leaves Bag o' Chips in two ways on this page. I separated the leaves from the circles and stacked the circles to created a layered embellishment. I colored these pieces with Java PowderPuff Chalking Ink. I also scattered the leaves around the page. I left the leaf die-cuts in their raw state and embellished them with rhinestones for a touch of sparkle. I love the way you used the negative space from the leaves!!!! Great layout! Love it! My favorite colors and a beautiful layout.